Arrow 4.9 “Dark Waters” recap/review: Oliver and company are cleaning up Starling Bay, with children and good cheer, when a drone sprays the beach with bullets. Oliver retaliates by outing Damian Darhk to the world. Uh-oh. Darhk is definitely retaliating. You know what else is out? Donna and Lance are boyfriend/girlfriend. Well… Lance was a little surprised about that, but happily so. Diggle tries to get info out of Andy, but Andy is super weird and claims to know nothing. I really want to know what the hell is up with his crazy. Donna Smoak found the ring. Now Felicity thinks Oliver is about to pop the question. Until she doesn’t. She soon realizes that the night of the soufflé was the original intention for the proposal. And now it’s been months with nothing. She’s worried. Thank goodness she doesn’t keep this to herself for long, and shares her worries with Oliver. Just then, retaliation time. Darhk steals Diggle, Thea, and Felicity, intending to kill them in a gas chamber. Oliver gives himself up, but then the rest of the cavalry arrives, including Merlyn in an Arrow suit. Good cover. The Canary Cry frees them from gas death. We see Malcolm be better with the arrows, and blow Darhk up, but he’s alive. There are some flashbacks this episode. the only part that caught my interest though was… shark!!!! Oliver makes a speech after the threat has passed. On tv, he proposes to Felicity who says… yes! Duh! In the limo ride home, they get ambushed and Felicity is shot. The ending was crazy. Do I think Felicity will die? I actually don’t even though Oliver and Barry were grieving by an mysterious grave. I think it’s purposeful misdirection. This episode was great. It did have some stuff I did not care about (Lian-Yu and Andy), but the rest of the exciting moments more than made up for those. Arrow returns Wenesday, January 20th on The CW. 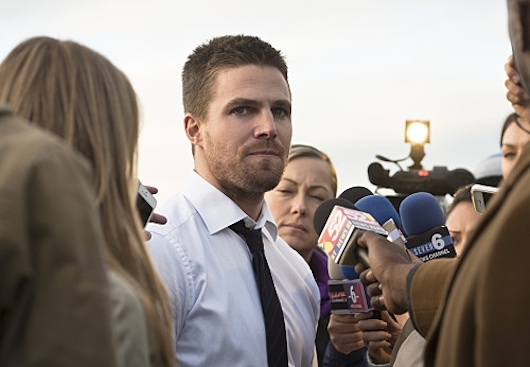 OLIVER TAKES ON HIVE — After the city is attacked again, Oliver (Stephen Amell) makes a bold move against HIVE. Malcolm (John Barrowman) checks in on Thea (Willa Holland) and leaves her with a warning. Things take a horrible turn when Damien Darhk (guest star Neal McDonough) retaliates in a brutal manner at Oliver’s mayoral holiday party. John Behring directed the episode written by Wendy Mericle & Ben Sokolowski (#409). Original airdate 12/9/2015. Oliver’s initiative to clean up Star City takes a dangerous turn.